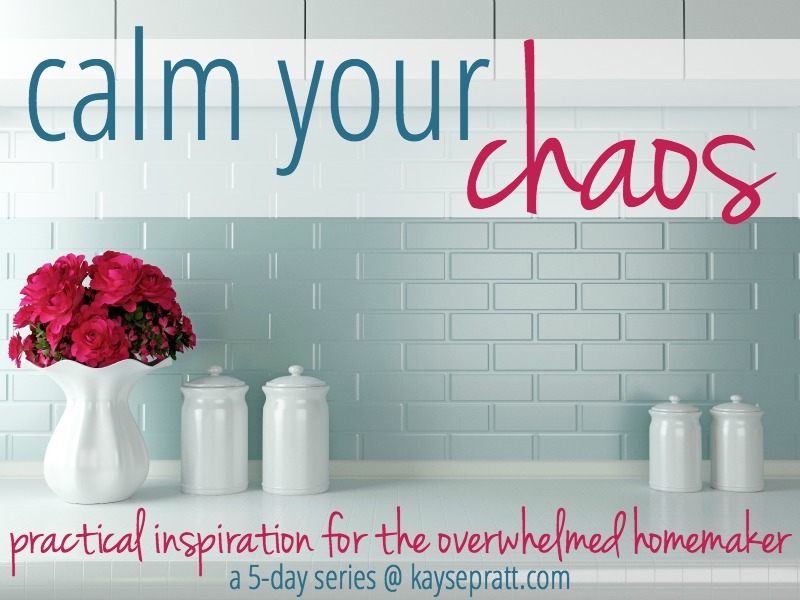 Calm Your Chaos :: Practical Inspiration for the Overwhelmed Homemaker! *I originally wrote this post for the back-to-school season, but I’ve realized it really applies to all of homemaking, any time of the year. It’s a peek into the way we’ve organized our home (and my heart! ), and my hope is that it provides you with some inspiration and encouragement for your own home! Every so often, I get emails and messages from you guys asking how I “stay so organized”. To which I laugh and try to reply with a picture of my sink full of dishes and my messy living room. I don’t have this under control, you guys. Let’s be honest right up front. I’ve got laundry piles and legos on the floor and baseboards that haven’t been cleaned since we moved in. I’m not good at keeping house. What I am good at, is setting up systems. Looking at the big picture and seeing what steps we need to take (and then taking those steps) to get to the place where we are functional, happy, and healthy. And that’s the goal, right? We’re never going to have spotless houses, at least not in these years of raising little ones. (And probably not after, either!) But I want my home to be a place of peace, of warmth, and of fun family memories. That’s hard to do when everything’s out of place. So we can agree that while homemaking isn’t EVERYTHING, it’s something. And when we learn and tweak and improve and do it well? Well, a peaceful home is a gift we can give our family. I don’t know about you, but here’s the thing in our house. If things are pretty organized, they tend to stay organized. If I stick to a pretty regular routine each day, then I tend to stick to that routine. But as soon as things get a little chaotic, so does my ability to reign it all back in. It takes so much more energy to bring everything back into sync than it does to just maintain a regular routine. And all of us – myself, Jon, and the kids – work better and live happier when we’ve got our daily routine on standby. It brings a sense of calm to a house that could be (and sometimes is) totally chaotic. So this week, I’m taking the time to get my house and my heart in order, so that we can have less-stressed homes. And I’ll share it all with you, because maybe you’re in the same boat, and friends don’t let friends stay stressed! First, we’ll talk about putting systems in place that make sense in YOUR house. Home management systems, chore charts, family calendars, and more! Next, we’ll talk about a few simple things we can do to get our days started in a peaceful way, no matter what time we wake up! After that, we’ll talk about how getting our daily plan down on paper makes all the difference in the world, and I’ll share with you the tools I use to do that! And lastly, we’ll wrap up by talking about the dreaded 5:00 beast – DINNER. I’ll share how I plan out my meals each week, and a couple of tricks I use to make homemade dinner a little less stressful and a little more do-able. On Saturday, I did that. Jon gave me a few hours to get away to Panera, and I got to enjoy the quiet and get everything all sorted out in my head. I walked through the process I use every time I need to get my life all figured out again, and nailed down my priorities and my focus for this season. Jesus. I’ve gotta start my days with Jesus and keep our home centered on Him. This is harder than it sounds. Fitness. Honestly, I wish this one wasn’t on the list, because it’s what I enjoy the least. But I have to make exercise and eating right a daily habit. Emily asked me if I had any strength the other day. This is a bad sign. Homeschooling. We’ve chosen to homeschool Emmy for this season, and that means that I have to actually take this seriously. More on this another time – I’ve got a lot to share here! Writing. Both here on the blog and another project I’m working on. This comes last, and it’s a fight for me to remember that. Writing could easily take the second or third place for me because I love it so much. But here is where it belongs in this season. And my focus for this season is this: Know Jesus. Share Jesus. Love well. In my family, in my faith, and in every other area of my life, this is what I know I’m called to in this season. And keeping that as the focus helps me sort out every thing else. Even meal planning! Getting all of that foundational stuff straight helps me think so much more clearly when I’m getting ready to plan everything else. It calms the chaos in my mind and allows me to focus on the tasks right in front of me, making decisions that reflect my priorities and line up with my focus. Come on back tomorrow so we can talk about setting up simple systems in your home that work for YOU! It’s not gonna be the same for everyone, but I’ll share what we do, plus some practical inspiration that will help you figure out what works best for you! Let’s take this week together to calm the chaos in our heads and our homes, and set ourselves up for a home environment that’s full of peace and way less stress! *I do just want to throw out there the fact that true peace only comes from Jesus. Routines and systems and schedules and planners are all wonderful, but they are no substitute for a relationship with the Prince of Peace. This series is not meant to take the place of that by any means, only to share some tips and tricks I’ve learned through trial & error in my own home, and give you some practical ways to bring a little organization to your daily life! 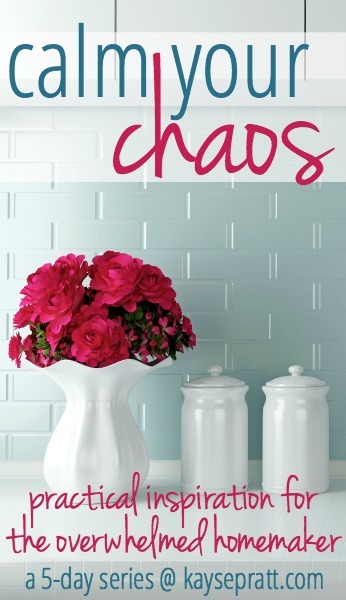 Know a friend who could use some calm for her chaos? Share this series with her!! Remember – friends don’t let friends stay stressed! This is such a great reminder to set priorities for each season! Currently, I need to work on my health too. It has not been a priority in this season and it should be. When I’m feeling frustrated with how things are going in my life or home, I know it is times to reset and check that my life is reflecting my priorities. I love that you got away where it was quiet so you could devote your attention to resetting your life. Thank you for these series…our oldest daughter who is raising and homeschooling our 2 grandchildren, live in Mexico, as Missionaries. I send her your links but the internet is so bad there, sometimes it works and sometime not…one day at a time walking with The Lord! Thank you for your upbeat spirit. Hello! Thank you. i was looking for a way to put my mornings together. You not only gave me inspiration. I’m looking forward to seeing what you do with this–I know all of it won’t quite apply to where I am right now, since my only child is not even quite two months old, but I am getting back into some (very) part-time work for the start of the school year, and I really do need all the tips I can get for getting dinner on the table right now! I’m almost all out of my pre-baby prepped freezer meals!